Rockfish aren’t usually known for their good looks, but the tiger rockfish is out to change that. They are appropriately named after the thick dark bars that run down their bright orange body. Although not as voracious, they are (arguably) just as beautiful as the predatory cat they are named after. They can be found along the sea bottom in rock crevices, caves and around rocky outcroppings. 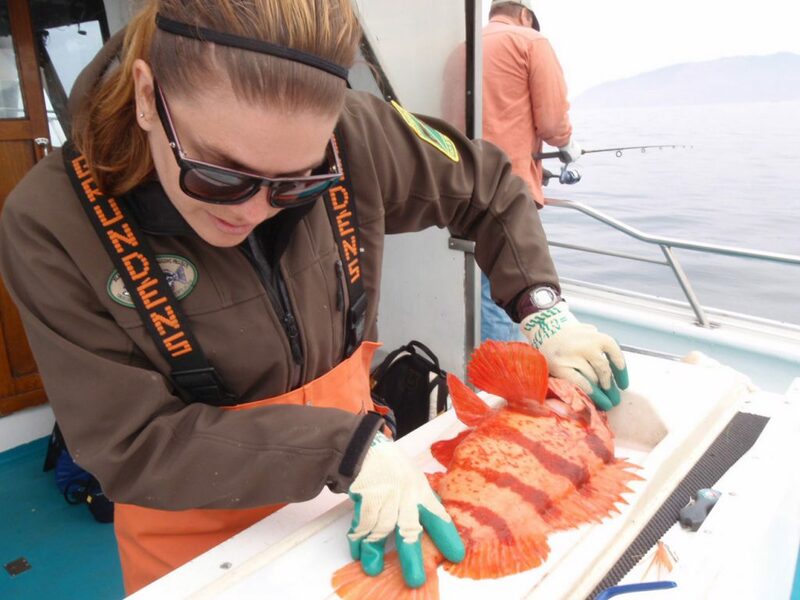 Researchers have seen tiger rockfish in Oregon’s Cascade Head, Redfish Rocks, Cape Falcon and Cape Perpetua Marine Reserves. Adult tiger rockfish live in deep water, generally preferring depths greater than 60 feet and have been seen as deep as 360 feet. The ODFW Marine Reserves Program generally catches them between 100 and 160 feet during our hook and line surveys. Young tiger rockfish, however, like to stay as shallow as 30. 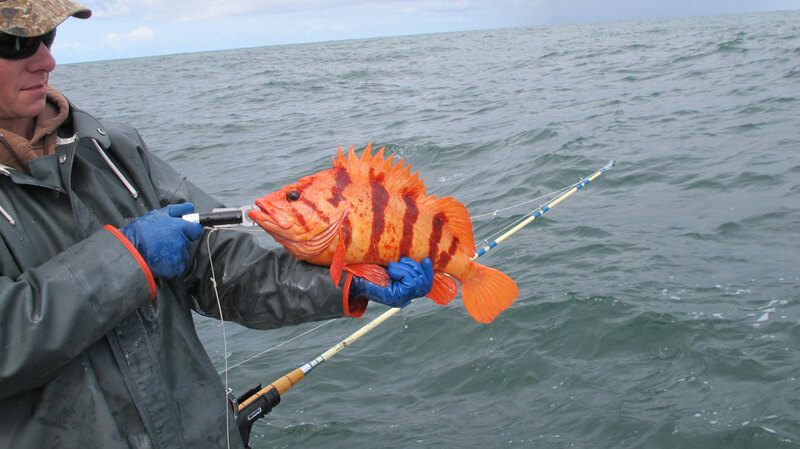 Tiger rockfish are infrequently caught by researchers or recreational and commercial fishers. For that reason, little is known about their life history and population status. In fact, in the past few years we’ve been monitoring marine reserves there have been only about 15 tiger rockfish caught in our hook and line surveys. Like other rockfish, tiger rockfish are live bearers. This means the fish retain their eggs inside their bodies and give birth to live, free-swimming young. For the next two months these larval fish live within the currents of the mid water before making their way to settle. The odds of surviving this stage of life are low and it doesn’t get much higher once the juvenile fish make it to shallow nearshore waters. Unfortunately this is compounded by being a slow growing species and the slow rate that they reach sexual maturity. Maturity is based on body size rather than age, males reach maturity around 14-19 inches and females around 11-18 inches. This normally takes at least 8 years, but can take more or less depending on the ocean conditions. Adult tiger rockfish can live for over 116 years and some have been aged to around 166 years. Tiger rockfish are somewhat mysterious because of how little we know about them. But, we do know some things such as, they like living on their own rather than forming schools or pairs and that they prefer to live around rocky outcroppings near sandy bottom habitat. However, there are many more questions to answer, such as: what are their breeding habits, what is a sustainable population level, and what does Oregon’s population of tiger rockfish look like? In two weeks, we are kicking off our fall field season and will be out at Cape Falcon and Redfish Rocks Marin Reserves and maybe we’ll get lucky and see a tiger rockfish or two.